It’s time for another Splatoon 2 Splatfest, and this time it’s the battle of the condiments! 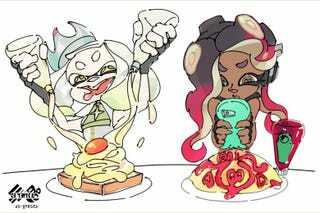 While ice cream completely beat out cake in both the debate and the Splatfest, I have a feeling that mayo and ketchup are going to be at least a little more even. I like both, but I’m going to have to go with mayo. I thought long and hard about it, and I came to the conclusion that if a burger or fries are good enough, they shouldn’t need ketchup, whereas mayo makes whatever they’re on better. Ketchup makes bad food okay, whereas mayo makes okay food actually good. But I’m a lot less cemented in that opinion than I was for ice cream vs. cake. Sorry, I forgot I was on the internet. What I meant to say was: MAYO Iz BEzT CONDIMENT AND IF U THINK KECHUP Iz BETTER THEN U R WRONG LOzER!!! As always, be respectful of other’s opinions as long as they align perfectly with yours. If not, feel free to split into groups of four and shoot ink at each other and the surrounding area until time’s up, at which point a cat will judge who covered the most. You could also play Splatoon 2.